** Power 6 Way Driver Seat ** Uconnect 5.0 ** Voice command with Bluetooth ** Dual Zone Temp Control ** Power Mirrors with Manuel Fold Away ** Keyless Enter 'N Go ** Immediate savings of $4,999 off market price! 2016 Challenger SXT Dodge Certified, with only 25,000 Miles! Every Dodge CPO Vehicle can be counted on to go the distance. Our CPO vehicles must pass a stringent certification process that guarantees only the finest late model vehicles get certified. Every vehicle that passes is then subjected to a comprehensive 125-point inspection and a thorough reconditioning process using Authentic Mopar® Parts. This Dodge Challenger, Stock number DE53630 features a Blue exterior. A few of this Challenger's features include: a USB, Power Windows, Steering Wheel Audio Controls, Multi-zone Climate Control, U-connect Infotainment System, Heated Mirrors, Color Matched Bumpers, Electronic Stability Control, Power Mirrors, Traction Control, Voice Command, an Anti Theft System, Brake Assist, a Power Drivers Seat, a Compass, a Bluetooth Cell Phone Hookup, Cloth Seats, an Overhead Console, Illuminated entry, Bucket Seats, Anti-Lock Brakes, a Tire Pressure Monitoring System, Alloy Wheels, Delay-off headlights, an Outside Temperature Gauge, an AM/FM Stereo, Rear Reading Lamps, Dual Air Bags, Automatic Climate Control, Overhead airbag, Speed Sensitive Steering, Air Conditioning, Head Restraints, Cruise Control, Satellite Radio, an Auto Headlamp, an Auto Dimming R/V Mirror, Bluetooth, Rear Seat Center Armrest, Remote Entry, a Front Side Air Bags, Intermittent Wipers, a Split Folding Rear Seat, a Tachometer, Vanity Mirrors, a Center Arm Rest, a Rear Window Defroster, Variable Speed Intermittent Wipers, Power Steering, a Trip Computer, and a Reading Light(s). Factory equipped with an impressive 3.6l v6 24v vvt engine, an 8-speed automatic transmission and rear wheel drive, this Dodge Challenger is ready to conquer the roads! For even more peace of mind, this Chrysler certified vehicle comes with a factory-backed 7-Year/100,000-Mile Powertrain Limited Warranty, 3-Month/3,000-Mile Maximum Care Coverage, 24-Hour Towing and Roadside Assistance, Car Rental Allowance, CARFAX Vehicle History Report and an introductory 3-month subscription to SiriusXM® Satellite Radio. 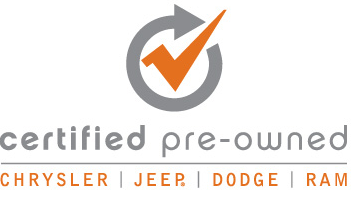 All Chrysler Certified vehicles also undergo a 125 Point Vehicle inspection for your peace of mind.